When I was planning for my trip to Oahu, Hawaii, one of the most common, well-intentioned advice I received was to be prepared to spend a fortune on food. This was not my experience. D and I were able to eat on about $40-$50 a day for the both of us (errr… save for the couple of meals where we purposely pigged out). Being foodies, we arrived on Oahu with a short list of must-hit-up places, and we also came upon a few great finds during our exploration of the island. We are both not ones for extravagant dining and are happiest sitting in a little hole-in-the-wall and walking out feeling like we have just discovered a local gem. 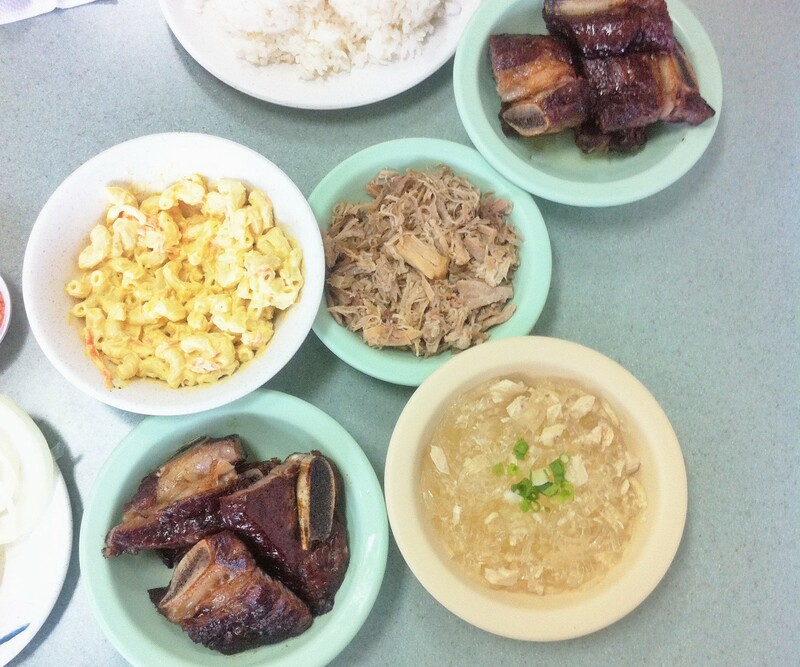 Below are some of our favorite and most memorable Oahu cheap eats, that I will feel comfortable recommending to anyone. You can download this article to read offline on GPSMyCity here. In true foodie fashion, we hit up Helena’s straight from the airport upon landing. D had seen this homey, unpretentious little restaurant featured on the Travel Channel show “Man vs. Food”, where it was hailed as serving the most authentic Hawaiian food. We ordered a generous wide variety of small dishes to try ($3-$5 each), including the famous pipikaula short ribs, kalua pork, lau lau, chicken long rice, and mac salad. This no-frills restaurant serves up the kind of homemade authenticity you would expect from dinner at grandma’s. Eating here gives the sense that you are experiencing generations-old recipes kept at their truest and most traditional forms. After all, where else can you get poi (a slimey taro mush…not often a favorite but an ancient Polynesian staple)? The kalua pork is cooked the traditional way in an imu (underground oven) and translates into a perfectly tender, smoky flavor. The thick-cut short ribs are hung to dry for maximum flavor and are accompanied with raw onion and pink rock salt (so good we ordered 2 portions). The meal is completed with a complimentary haupia, a traditional thick coconut pudding. I fell in love with haupia here and sadly, Helena’s was the only place I was able to get it on this whole trip. As this was the first place we hit up, it set the standard for the rest of our food tour. Coming here first may have been a mistake as many of the other Hawaiian food we tried throughout our trip did not measure up. As such, we also chose Helena’s as our last meal on the island. Tips: This little hole-in-the wall is only open from Tuesday to Friday 10:30am to 7:30pm. It is located in a tiny run-down strip mall with a tiny parking lot. We were lucky to have arrived off-prime-eating-hours both times when the parking lot was relatively empty. Otherwise, good luck circling the block for street parking. Cash only. This was recommended by a friend who used to live on Oahu, and so we made a special trip to the North Shore to seek it out. This small family owned walk-up-and-order restaurant is located in an unassuming strip mall with picnic style tables out front. 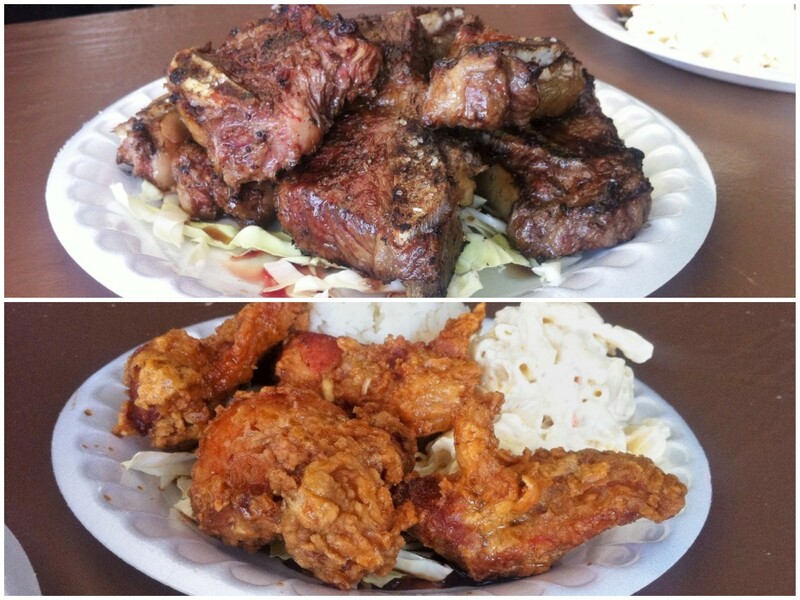 After asking the super friendly staff what the locals love, we ordered the mini order of garlic chicken and a plate of pulehu short ribs ($18 total). The short ribs were incredibly thick-cut and juicy and only garnished with rock salt, which speaks to the high quality taste of the meat. The garlic chicken was perfectly fried and crisped (reminiscent of the Japanese karage) with a sweet garlicky breading layer, while the meat inside was tender and moist. Throughout the rest of our trip, as we raved about Papa Ole’s to some locals, I was surprised to hear that not too many have heard about it. This place is truly one of Oahu’s best kept dining secrets. Tips: Parking is plentiful as it is in a large strip mall with a drugstore. Hours are Mon, Thurs-Sun 7am – 9pm, and Tues 7am-3pm. What do you do when you accidentally arrive at Dole Plantation half an hour too early? Yelp the closest, highest rated breakfast diner, of course. Sunny Side was only a couple of miles from the plantation and we were ecstatic to find that it served up spam and eggs. For some reason, even though we had been on the island for 4 days by then, we had yet to find a place that served this classic island breakfast (aside from McDonald’s). 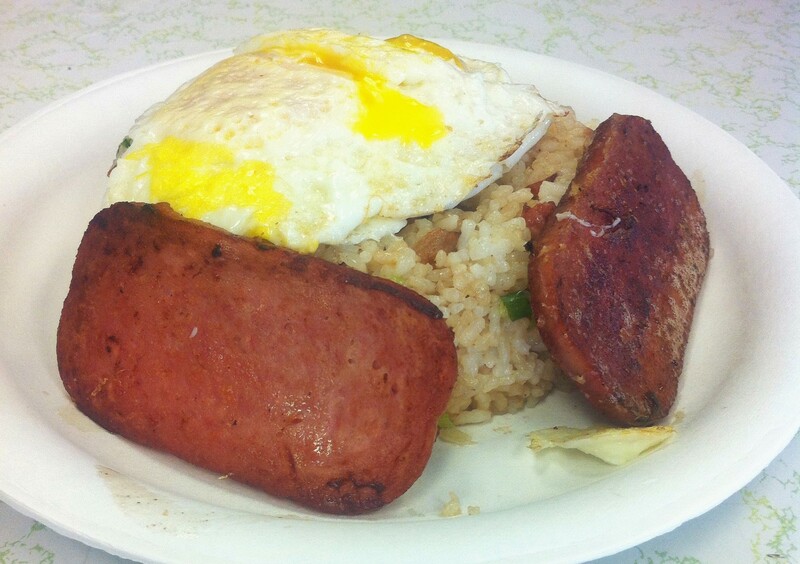 We ordered spam and 2 over-medium eggs with their fried rice special, which is basically rice fried with bacon and green onions ($7.50). Greasy? Yes. Unhealthy? Yes. Satisfying? Hell yes! The place was crowded with locals… I was pretty sure we were the only tourists there that morning. It was just as well that we stepped out for a true, authentic Hawaiian breakfast, as the menu at the Dole Plantation was (crudely put) crap. Tips: Sunny Side is actually known for their pies. I regret not getting one. Parking is a tiny lot with far too few spaces for the amount of people inside and in queue. We were lucky to snag a spot as a customer was leaving. Otherwise, there’s a park across the street to park at. Cash only. When a place has almost 1800 Yelp reviews and 4.5 stars, you know it’s a local hotspot. And when there are only 5 items on the menu, you know this place has mastered the craft. There is perpetually a line out of the door at this cozy Japanese restaurant where customers eagerly await their turn to get the coveted bowl of udon, crunchy tempura, and/or savory musubi. 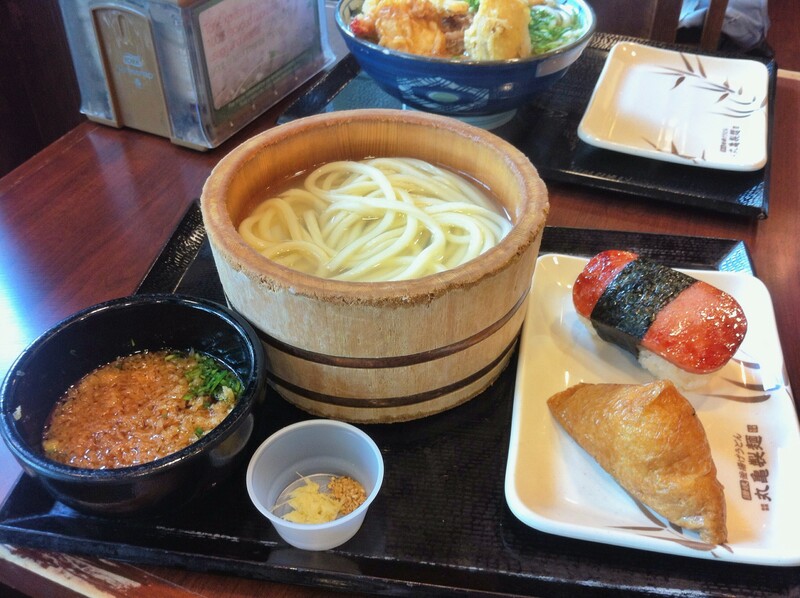 Behind the cafeteria-style counters, it’s a madhouse as chefs craft udon, measure portions, spoon broth, and fry tempura to serve the never-ending line. Even through all the craziness, there is amazing attention paid to detail, as seen in the act of dipping each bowl into boiling hot water just before serving in order to maintain an even temperature for the broth. Although the prices are cheap, the flavor of the broth is anything but. Tips: Don’t be afraid of the long line. It moves fast and the tables turn over even faster. We walked here from our Waikiki strip hotel.. a brisk 15 minute walk. Otherwise the only parking is street. We came to this diner on a whim as we were meeting up with some friends in the area and they suggested this. This seemed to a local favorite as well as a tourist destination. At noon, there was an 1.5 hour wait, and the outside patio was packed with waiting customers despite the light sprinkle that day. Tips: Decent sized parking lot in the back. Only open for breakfast and lunch: Mon-Fri 7:30 am – 2 pm, and Sat-Sun 7 am – 2:30 pm. Only tip is to patiently wait. 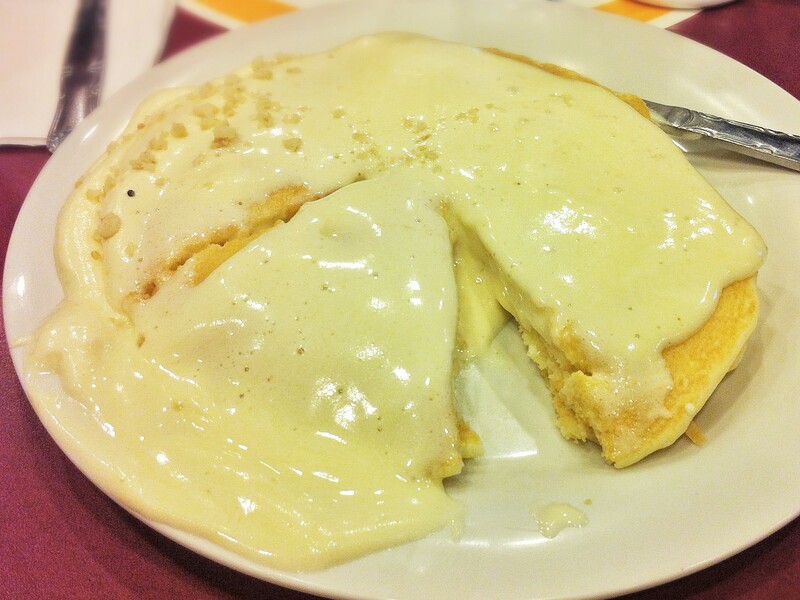 Trust me, the macadamia nut sauce pancakes are worth it. This is coming from a girl who neither has patience nor likes pancakes. To start, these were some of our favorite, affordable places. Read on for Part 2 – even more cheap eats! If you loved this article and want to eat what I ate, download this article on GPSMyCity here. You can get a GPS-guided map that you can use offline!